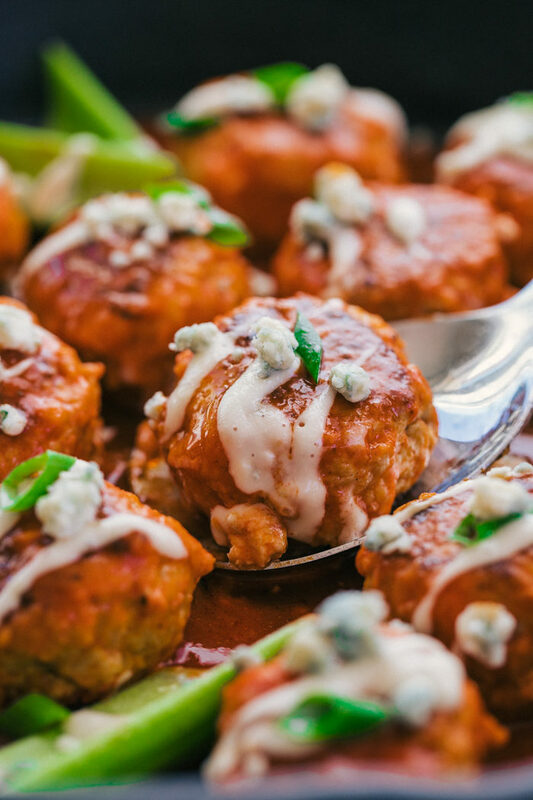 Buffalo Chicken Meatballs are a bite sized powerhouse of flavor topped off with an amazing hot sauce and layered with blue cheese dressing and blue cheese crumbles. 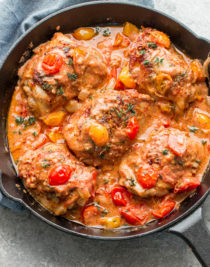 If your in the mood for super tasty and a little heat you are going to love these Buffalo Chicken Meatballs. Now you can enjoy that blue cheese and hot sauce in a bite sized meatball that will have you super addicted. 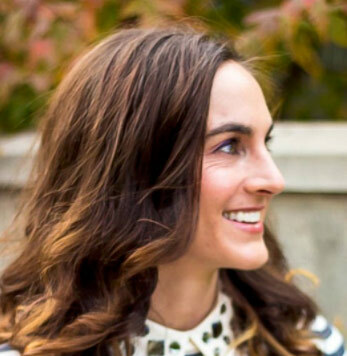 Meatballs are just one of those foods that bring the conversation to them. Wherever there is meatballs there is a party. They just have this way of sucking you in and eating one after another, after another and before you know it you have made new friends and the meatballs have disappeared. A meatball is ground beef, chicken, or pork rolled into a ball and baked, fried, or steamed. Often times meatballs have binding agents in them to keep them together and moist, such as breadcrumbs, eggs, or butter. Why are meatballs so good? Meatballs can be made into just about any cuisine you are craving. 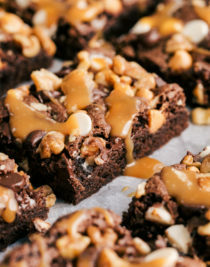 They are easy to make and fun to eat. 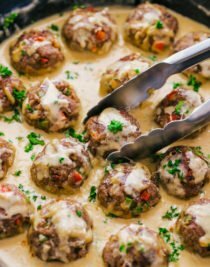 Meatballs are super addicting to eat and are always a big party pleaser. 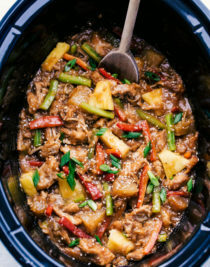 They can be doused with sauce, mixed with pasta, put on a sandwich, made with a casserole, cooked in a crockpot, fried in a skillet, added to stir fry ( Teriyaki Meatball Stir Fry), and so much more. 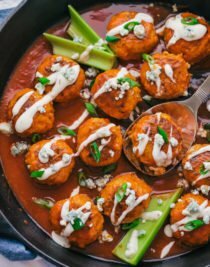 If you love the flavors of buffalo chicken wings, then you are going to love these Buffalo Chicken Meatballs. How do you make meatballs? Mix everything together until well combined. 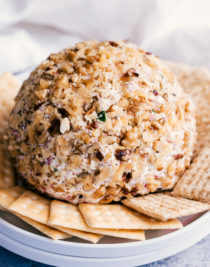 I use my hands to make sure all the ingredients are mixed thoroughly, and form into 15 balls. In a large skillet over medium heat add 2 T of olive oil and cook meatballs until brown on all sides, turning occasionally, about 8-10 minutes. Remove meatballs and set aside. How do you make Buffalo Sauce? Mix to combine and heat until slightly bubbling, about 5 minutes. Add the meatballs back in, turn to coat with sauce and garnish with blue cheese dressing, blue cheese crumbles, and green onion. 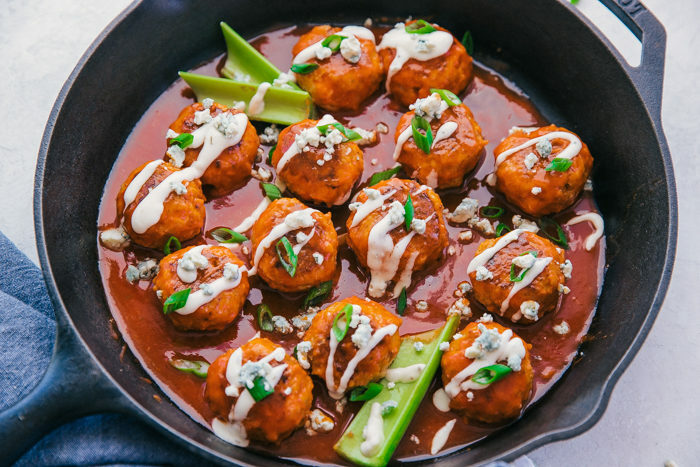 Buffalo Chicken Meatballs are a definite party pleaser and on a scale of easy, moderate, or hard to make, they rank on the easy side. 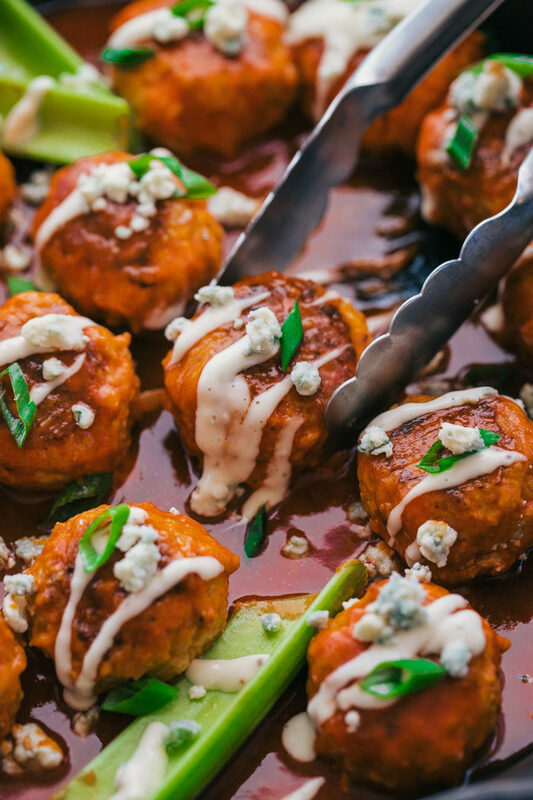 So bring the life to the party and the taste to your lips with these sensational Buffalo Chicken Meatballs. Appetizers shouldn’t be hard to make, but they should be delicious to eat. 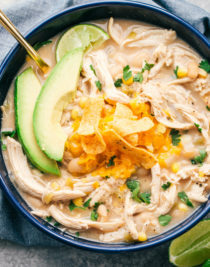 Looking for more delicious skillet recipes? In a large bowl combine all ingredients for the meatballs except the olive oil, mix thoroughly and roll into 15 balls. In a large skillet add 2 tbsp olive oil over medium heat. Add the meatballs and cook until brown on all sides, 8-10 minutes. 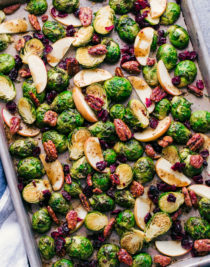 Remove from skillet and set aside. 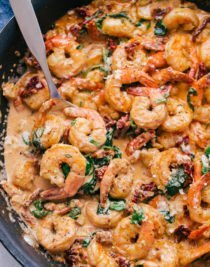 In same skillet over medium heat, add all the ingredients for the sauce, mix well to combine and allow to come to a slight boil. Reduce heat and add the meatballs back in to skillet. Roll meatballs in sauce so all sides get covered. Remove from heat and garnish with blue cheese dressing, blue cheese crumbles, and diced green onions. Serve warm. All images and text ©The Food Cafe.